Water heaters are one of the most important parts of the comfort that your home provides to you and your family. When you have any problems with your home's water heater, it can turn your home into a place that's uncomfortable and unsanitary. You'll need to have repairs performed as soon as possible, and you need to know that those repairs will be totally reliable. At Cooper's Inc., our professional plumbers in Topeka can provide you with water heater repairs, maintenance services, replacements, or installations. No matter how large or small the water heater services you need are, our plumbers will be ready and eager to tackle the job. We'll do whatever it takes to help you keep your water heater as effective and efficient as possible at all times. Keeping your water heater in great shape is a major priority, and waiting until the system starts to malfunction before you have it serviced only ensures that the problems will be more serious and costly to repair. 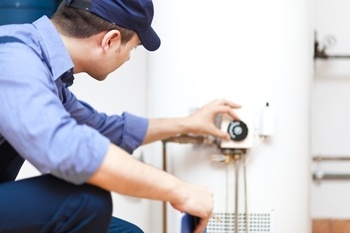 Our professional plumbers recommend that you have water heater tune-ups performed regularly. Our water heater maintenance services will help reduce the frequency of necessary repairs and extend your water heater's lifespan. No matter how frequently your water heater is maintained, it will eventually need to be replaced. When it's time to replace your water heater, our plumbers will be able to handle every part of the job. We can help you determine which new water heater would be best for your home, and we can perform a high quality installation. We'll be able to properly dispose of your older water heater and guarantee that your new unit is as efficient and effective as possible. When you need to have your water repaired, our plumbers will be able to accurately diagnose the problem and perform thorough repairs. We'll do whatever it takes to get your water heater back into excellent condition, and we'll guarantee your complete satisfaction with all of our plumbing services. For quality water heaters in Topeka, please call Cooper's Inc at 785-267-4100 or complete our online request form.